Every year, hundreds of students, parents and teachers enjoy hands-on learning as part of their social studies education at the award-winning Beaver Area Heritage Museum. 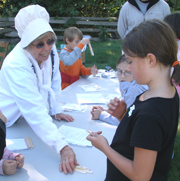 In the process, they experienced a taste of frontier life of the late 1700s and early 1800s. 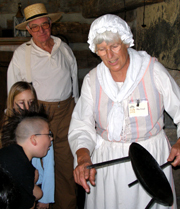 Working closely with the Beaver Area School District, SS Peter and Paul School and the Beaver Valley Intermediate Unit, our dedicated team of volunteers (primarily retired educators) use a specially tailored curriculum and serve as costumed docents in an innovative program that supports student learning in the first, third and fifth grades. In the museum, students see artifacts telling the story of the people, places and events that have shaped the history of our area. In the log house, they focus on four activities — cooking, crafts, gardens and games. First Graders receive a brief overview of “Beaver,” including the town, the animal and the Native American King, all bearing that name. In the log house, they focus on animals of the area, the importance of the hearth and settlers’ reliance on bread as part of the diet. Third Graders have a more in-depth tour, including a focus on the timeline mural and early Native Americans. They re-enact the signing of the 1785 Treaty of Fort McIntosh; learn about apples grown in the region and cook an apple sauté over an open fire. The emphasis is on the contribution of all pioneer family members who worked alongside their parents for survival. Fifth Graders’ tour includes a scavenger hunt, cooking stew, writing with a quill or steel-tipped pen; playing the game “Quoits;” and dressing up in clothing typical of the 1802 era. Fifth graders also enjoy a “History By Trolley” tour of Beaver, led by museum docents. In this program, students learn more about history in their own community, with numerous stops, including the Beaver Cemetery and Clark Square.  Funding has been provided by the Rotary Club of Beaver, Beaver Area Education Foundation, Beaver County Educational Trust, College Square School PTA, gifts from the Morgan and Shaw families, and student fees. Coloring books, History By Trolley, are distributed to all participants, published courtesy of the GCU (Greek Catholic Union). Additional copies are placed in the school and public libraries as well as the museum archives.